Administratively, Novgorod Oblast is divided into three cities and towns of oblast significance and twenty-one districts. In terms of the population, the biggest administrative district is Novgorodsky District (57,685 in 2010), the smallest ones are Poddorsky District (4,645) and Maryovsky District (4,673). In terms of the area, the biggest administrative districts are Novgorodsky District (4,600 square kilometres (1,800 sq mi)) and Lyubytinsky District (4,500 square kilometres (1,700 sq mi)), the smallest one is Volotovsky District (995 square kilometres (384 sq mi)). Administrative districts of Novgorod Oblast. The numbers denote the following districts: 1- Batetsky, 2 - Borovichsky, 3 - Kholmsky, 4 - Khvoyninsky, 5 - Demyansky, 6 - Krestetsky, 7 - Lyubytinsky, 8 - Malovishersky, 9 - Maryovsky, 10 - Moshenskoy, 11 - Novgorodsky, 12 - Okulovsky, 13 - Parfinsky, 14 - Pestovsky, 15 - Poddorsky, 16 - Shimsky, 17 - Soletsky, 18 - Starorussky, 19 - Chudovsky, 20 - Valdaysky, 21 - Volotovsky, A - Borovichi, B - Staraya Russa, C - Veliky Novgorod. The town of Staraya Russa is municipally incorporated as Starorusskoye Urban Settlement of Starorussky Municipal District. December 29 [O.S. December 18], 1708 Tsar Peter the Great issued an edict which established seven governorates. The description of the borders of the governorates was not given; instead, their area was defined as a set of towns and the lands adjacent to those towns. The present area of Novgorod oblast was a part of Ingermanland Governorate, which was renamed Saint Petersburg Governorate in 1710. The governorates were subdivided into uyezds, and uyezds into volosts. In 1727, a separate Novgorod Governorate was established. It was subdivided into five provinces, and the current area of Novgorod Oblast was split between two of them - Novgorod and Velikiye Luki Provinces. In 1772, Velikiye Luki Province was transferred to newly established Pskov Governorate. In 1775, Novgorod Governorate was transformed to Novgorod Viceroyalty, and in 1777, Pskov Governorate was transformed to Pskov Viceroyalty. In 1796, both governorates were re-established. By the 1920s, most of the area of current Novgorod Oblast belonged to Novgorod Governorate. Kholmsky and Soletsky Districts belonged to Pskov Governorate, and a part of Batetsky District belonged to Petrograd Governorate. On August 1, 1927 the governorates were abolished, and merged into newly established Leningrad Oblast, which included the northwestern part of Russian Federation. The oblast were subdidived into 140 districts, which were grouped into nine okrugs. The current area of Novgorod Oblast was spread into six of these nine okrugs, Borovichi, Cherepovets, Leningrad, Luga, Novgorod, and Velikiye Luki Okrugs. On June 3, 1929 Velikiye Luki Okrug, which included Kholmsky District, was transferred from Leningrad Oblast to Western Oblast. Later on, it was transferred into Kalinin Oblast. In 1930, the okrugs were abolished, and the districts were directly subordinate to the oblast authorities. Between autumn of 1941 and spring of 1944, during the World War II, western parts of the current area of Novgorod Oblast, including the city of Novgorod, were occupied by German troops. After the liberation, the administrative division of Soviet Union was considerably changed, and on July 5, 1944 Novgorod Oblast with the center in the city of Novgorod was established. On August 22, 1944 Kholmsky District, which was a part of Novgorod Oblast, was transferred to newly established Velikiye Luki Oblast. On October 2, 1957 Velikiye Luki Oblast was abolished, and Kholmsky District was transferred to Pskov Oblast. On July 29, 1958 it was transferred back to Novgorod Oblast. In the middle of the 1960s the oblast went through the abortive Khrushchyov administrative reform, when districts were first divided into large-scale agricultural and industrial districts, and several years later these were abolished, and the oblast got a district structure different from that before the reform. After 1927 (with the exception of the aborted reform of 1963-1965) borders between the districts sometimes were modified, and as a result some of the districts were abolished. This list includes the districts which existed in the current area of Novgorod Oblast. Zaluchsky District (the selo of Zaluchye), established in 1927, abolished in 1961, split between Molvotitsky (currently Maryovsky) and Starorussky Districts. In the end of the 1920s minor areas which are now parts of Novgorod Oblast were parts of short-lived Budogoshchensky (with the center in Budogoshch) and Pikalyovsky Districts (Pikalyovo). Much of the area of these districts belongs now to Leningrad Oblast. Rozhdestvensky District (with the administrative center in the selo of Rozhdestvo), Leningrad Oblast, was established in 1927, abolished in 1931, and merged into Bologovsky District. Much of its area is currently in Tver Oblast. Troitsky District (with the administrative center in the selo of Troitsa-Khlavitsa), established in 1927, was renamed Lovatsky District in 1930, and abolished in the same year, being split between Kholmsky and Loknyansky Districts. The area of Lovatsky District is currently split between Pskov and Novgorod Oblasts. 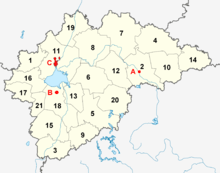 Podberezinsky District (with the administrative center in the selo of Podberezye) was established in 1945 as a part of Velikiye Luki Oblast, moved in 1957 to Pskov Oblast, and abolished in 1958, being split between Kholmsky, Loknyansky, Velikoluksky, and Ploshoshsky Districts. The area of Podberezinsky Districts is split between Pskov, Tver, and Novgorod Oblasts. Several of the districts were renamed: Belsky into Lyubytinsky, Minetsky into Khvoyninsky, and Molvotitsky into Maryovsky (it was first abolished and then re-established under a different name). ↑ Государственный комитет Российской Федерации по статистике. Комитет Российской Федерации по стандартизации, метрологии и сертификации. №ОК 019-95 1 января 1997 г. «Общероссийский классификатор объектов административно-территориального деления. Код 49», в ред. изменения №259/2014 от 12 декабря 2014 г.. (State Statistics Committee of the Russian Federation. Committee of the Russian Federation on Standardization, Metrology, and Certification. #OK 019-95 January 1, 1997 Russian Classification of Objects of Administrative Division . Code 49, as amended by the Amendment #259/2014 of December 12, 2014. ). ↑ In 2008, the urban-type settlements of Krasnofarforny in Chudovsky Distroct lost its status and became a rural locality, see Изменения в административно-территориальном делении субъектов Российской Федерации за 2008 год (in Russian). State Committee of Statistics. Retrieved 22 February 2012. 1 2 3 In 2009, the urban-type settlements of Bolshaya Vishera in Malovishersky District and of Tyosovsky and Tyosovo-Netylsky in Novgorodsky District lost their status and became rural localities, see Изменения в административно-территориальном делении субъектов Российской Федерации за 2009 год (in Russian). State Committee of Statistics. Retrieved 27 January 2012. Municipally, they remain incorporated as urban settlements. ↑ Архивный отдел Администрации Мурманской области. Государственный Архив Мурманской области. (1995). Административно-территориальное деление Мурманской области (1920-1993 гг.). Справочник. Мурманск: Мурманское издательско-полиграфическое предприятие "Север". p. 19–20. ↑ Снытко, О.В. ; et al. (2009). С.Д. Трифонов; Т.Б. Чуйкова; Л.В. Федина; А.Э. Дубоносова, eds. Административно-территориальное деление Новгородской губернии и области 1727-1995 гг. Справочник (PDF) (in Russian). Saint Petersburg. p. 85. Retrieved 2 March 2011. ↑ Энциклопедия Города России. Moscow: Большая Российская Энциклопедия. 2003. p. 506. ISBN 5-7107-7399-9. ↑ Снытко, О.В. ; et al. (2009). С.Д. Трифонов; Т.Б. Чуйкова; Л.В. Федина; А.Э. Дубоносова, eds. Административно-территориальное деление Новгородской губернии и области 1727-1995 гг. Справочник (PDF) (in Russian). Saint Petersburg. p. 240. Retrieved 2 March 2011. Снытко, О.В. ; et al. (2009). С.Д. Трифонов; Т.Б. Чуйкова; Л.В. Федина; А.Э. Дубоносова, eds. Административно-территориальное деление Новгородской губернии и области 1727-1995 гг. Справочник (PDF) (in Russian). Saint Petersburg. Retrieved 18 December 2011.